So I have truly been avoiding going into my classroom this summer. I just have not been able to bring myself to go into that building quite yet...until today. I finally worked up the energy to go in and get some work done. Our amazing custodians have worked so hard to get our rooms ready for the kids coming back on August 12th. My floors are sparkling! I am so thankful for all their hard work. When I went in today, I realized just how much I have to do before all my kiddos come back for the year. I had planned to do LOTS of laminating to get centers prepared. Unfortunately, both the machines were jammed. Instead, I started reorganizing my furniture to get it the way I wanted. It always is like a puzzle getting all the furniture to fit just the way it should. Thankfully, I left my room feeling motivated. I have spent the rest of my day making my plans for reading. Thankfully we have full access online to our new reading program (Reading Street). I wish we had out textbooks in, but I will settle for the online access for now. With all this motivation (maybe just stress), I have made another activity for a reading center. This goes with Reading Street Unit 1, Story 3 (Kumak's Fish). 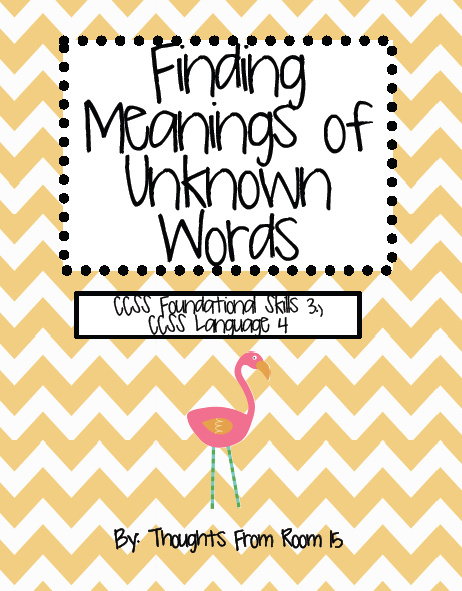 The skill is finding the meanings of unknown words. Get your own copy of my activity here.